First Year of Measure H Funding Approved by Board of Supervisors to Help End Homelessness! 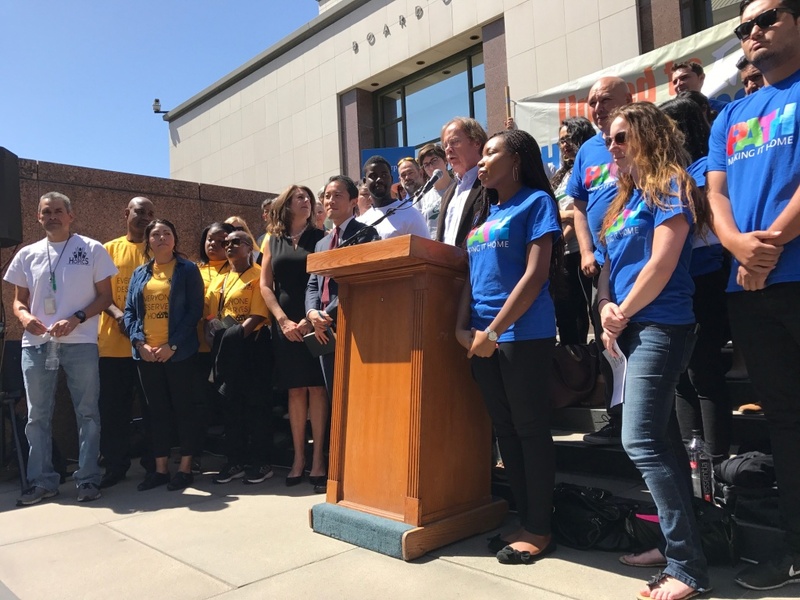 It was another “rainbow coalition” of supporters that came out on Tuesday, June 13 to support the Measure H funding allocation at the Los Angeles County Board of Supervisors meeting. In March, voters approved Measure H, a quarter-cent Los Angeles County tax that will provide $355 million/year over 10 years for an array of services proven to help people get off—and stay off—the streets. Sixty-six organizations sign a letter to the Board of Supervisors commending the Board for its leadership, calling for continued collaboration and accountability in moving forward. Supervisor Mark Ridley-Thomas called it a “historic” vote after an unprecedented, collaborative process that included representatives from 50 public and private organizations and stakeholders who developed the series of Measure H funding recommendations. "These are daunting numbers, but we're not daunted by them," said Chris Ko of the United Way, which helped lead the effort to pass the measure. "We're excited to get to work." Over 200 supporters came out to support the Measure H funding recommendations at a press event and rally organized by Move LA. Following the rally, more than 100 speakers testified in support of the motion by the Board of Supervisors, which passed unanimously. Over sixty organizations sign a letter to the Board of Supervisors commending the Board for its leadership, calling for continued collaboration and accountability in moving forward (read the letter). In its first five years, Measure H will help 45,000 homeless families and individuals and another 30,000 Angelenos stay housed. With the 23% rise in the homeless count over the past year, many expressed a renewed sense of purpose and urgency to deploy Measure H resources effectively.